The Bachelor of Business Administration in Marketing is a three-year programme. Applicants can apply for admission to Senior Year. This programme introduces students to the theoretical and practical aspects of marketing, including marketing management, consumer behaviour, promotions management, services marketing, marketing strategy and marketing research. Seven students from the OUHK Lee Shau Kee School of Business and Administration and School of Science and Technology joined this year’s ‘Help You to Start Your Business’ Competition and managed to obtain excellent results. 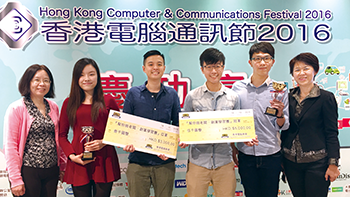 They formed two teams with students from other local institutions, and set up exhibition booths at the Hong Kong Computer & Communications Festival with a mission to achieve maximum revenue. Contestants were required to write a comprehensive business proposal and undergo online promotion campaigns to advertise their booths and products so as to accumulate invaluable experience of how to start and run a business. The champion team (「奇」艦店) won the ‘Best Online Promotion’ award and ‘Best Booth Design’ award, while the first runner-up team (E.T.) captured the ‘Best Presentation’ award.